Rivers State Government says the admonition to Rivers State traditional rulers to stay away from partisan politics is in the best interest of the state and integrity of the positions they occupy as impartial peace makers. Reacting to a press statement issued by Dr Chidi Lloyd on behalf of Tonye Cole Campaign organisation describing Gov Nyesom Wike's advise as inciting, the State Commissioner for Information and Communications, Emma Okah said the Direcor General is misguided because Rivers people are not in a hurry to return to the dark days before May 29, 2015 when the sword of agony was hanging over the head of traditional rulers if they did not openly support the APC. 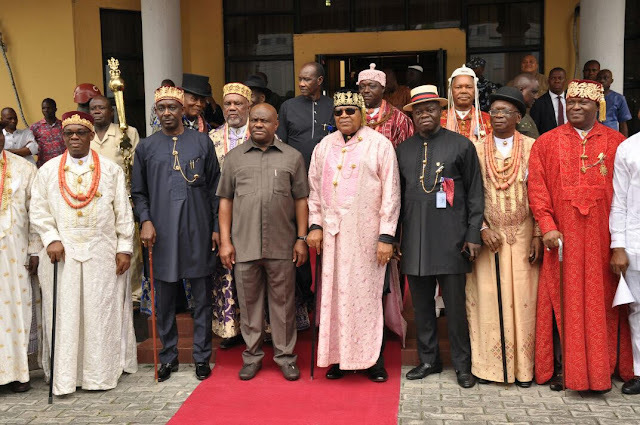 It is on record that some traditional rulers at that time were actively involved in partisan politics and taking advertisements in National and local newspapers to campaign for the APC and inspite of this, the Nyesom Ezenwo Wike administration did not punish any of them when he became governor. Although Tonye Cole is new to the politics of Rivers State, it is important that his Campaign Director states why the Elele King was denied staff of office, official vehicle and allowances after receiving Gov Nyesom Ezenwo Wike in his palace in Elele Town. Contrary to the cheap propaganda mouthed by the Campaign Director, Okah said traditional rulers are custodians of culture and tradition of their people as well as peacemakers in their domain. For this role, they are paid stipends from public funds as partners in development at the grassroot. Therefore, it is only natural that if they are to leave their domain for engagements with public agencies outside the state, the governor deserve notification as elementary courtesy demands. For the Director General to see such harmony and courtesy as evil tells a lot about the quality of the campaign he will direct if Arch Tonye Cole eventually becomes a governorship candidate in the 2019 elections. "We urge the Director General to heed the call by Gov Nyesom Ezenwo Wike to politicians in the State to stick to issue- based campaign as this is the minimum standard required of civilised people all over the world" Okah said, noting that the days of the jungle and acrimony are over in Rivers State .